The aurora could be visible here tonight. Maybe. 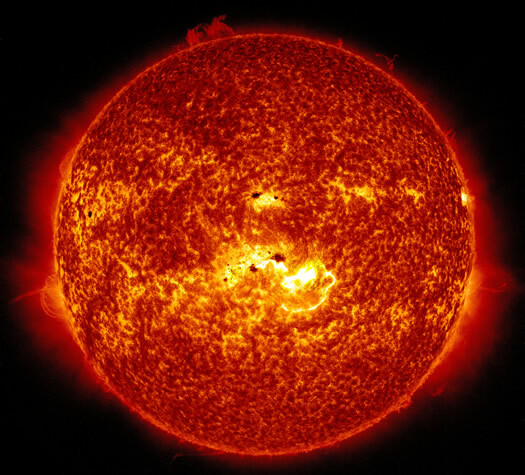 From NASA: "This pictures combines two images from NASA's Solar Dynamics Observatory captured on Jan. 7, 2013. Together, the images show the location of a giant sunspot group on the sun, and the position of an X-class flare that erupted at 1:32 p.m. EST." Also: Oooooh. Something to keep an eye out for overnight Thursday-Friday: the aurora borealis -- you know, the Northern Lights. There are projections indicating that we have a not-terrible chance of seeing some sort of aurora tonight. This forecast -- from the University of Alaska Fairbanks -- indicates the aurora could be visible near the horizon at latitudes as far south as Cleveland. And Accuweather has our area on the border of fair/poor for viewing. So, overnight, have a look to the north near the horizon. It might appear as a green or reddish glow. This is almost as AMAZING as AOA is to me! WOW, love this stuff, KEEP IT COMING! Back in the early 90's, my best friend lived in Mooers, NY... last exit off the Northway a stones throw from the Canadian border. It is flat farm country out there, nearest neighbors being a looong walk away in the winter. One winter night I was up visiting, and she had gone outside to let the dog run for a few minutes. I heard her yell, "Lilly! Get out here... hurry!" I thought she had hurt herself and went running... only to come upon the most spectacular sight in my life when I opened the door. "What is it?" I said, staring at the sky with my jaw on the ground. "Northern Lights." she said. Followed by, "No matter how many times I see it now, it still doesn't get old." I saw it last night around 9:30-10:00 PM from Cohoes. Not really a spectacular show, just a few faint streaks in the sky. Cool to be able to see it though.